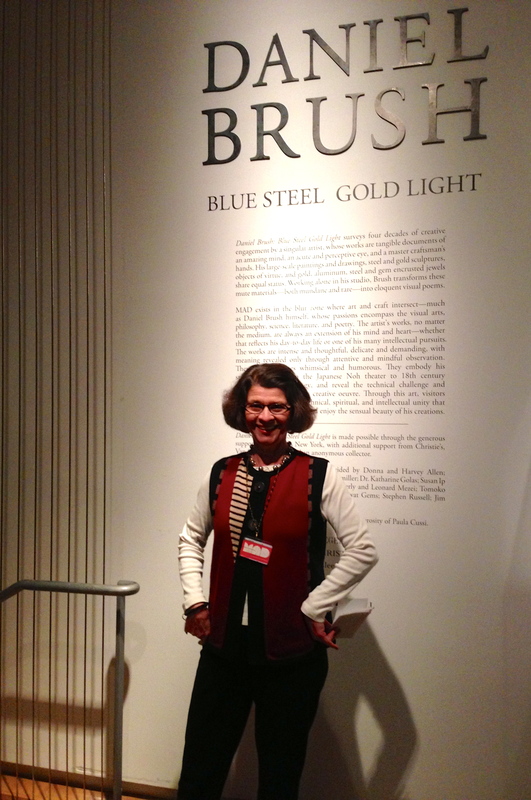 I saw the wonderful Daniel Brush show at The Museum of Arts and Design this past week. A visit to the museum is also like bumping into friends, as I often recognize the work of fellow craftsmen in the exhibits, in the museum shop,or a recognizable piece being worn by someone wandering the show. Thursday evening the docent happened to be wearing one of my good friend Sandra Miller’s designs, so I had to bolt over and make her pose, which she gladly did! She said the sweater was about 15 years old, and still looked brand new. Ah, the benefit of purchasing a well made garment. For me to spot a Toshiki & Maryszka shearling thou, I usually have to scan the ticket line or coat check room, which I have, and spotted one! This entry was posted in Inspirations, Uncategorized and tagged Daniel Brush, MAD Museum, Museum of Arts and Design, Sandra Miller Designs, Toshiki & Maryszka shearling coats. Bookmark the permalink. A Little Shearling Vest for #Nemo!